Established in the 1870s, the elegant Philadelphia Museum of Art houses a permanent collection of more than 225,000 works in 200 galleries. The museum is recognised as being one of the finest art collections in the USA. Exhibits include not only magnificent paintings, but also sculptures, period furniture, and faithfully restored historic rooms. 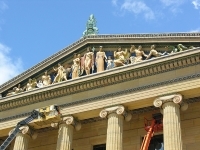 Built in the style of a Greco-Roman temple, the beautiful building housing the collection stands upon a hilltop off Benjamin Franklin Parkway. The two storeys are designed with L-shaped wings leading off a central court, and exhibits are arranged in period groupings. The museum also has a cafeteria and a formal restaurant, regularly hosts visiting exhibitions.